see Sarkanniemi Theme Park. There's much more to do: contemplate in the serene atmosphere at Tampere Cathedral, test your team's savvy at popular escape rooms, stroll through Pyynikki Park and Observation Tower, and take in the architecture and atmosphere at Finlayson Church. To find more things to do, ratings, other places to visit, and other tourist information, use the Tampere route builder app . Riga, Latvia to Tampere is an approximately 4.5-hour flight. You can also do a combination of flight and train; or do a combination of car and ferry. Traveling from Riga in June, expect Tampere to be little chillier, temps between 20°C and 9°C. Finish up your sightseeing early on the 24th (Mon) so you can catch the train to Kuopio. Kuopio is a city and a municipality located in the region of Northern Savonia, Finland. Your day-by-day itinerary now includes Puijo Tower. Start off your visit on the 25th (Tue): test your team's savvy at popular escape rooms, then explore the activities along Valkeisenlampi, then get a sense of history and politics at Kuopio Market City Hall, and finally take in panoramic vistas at Puijo Tower. 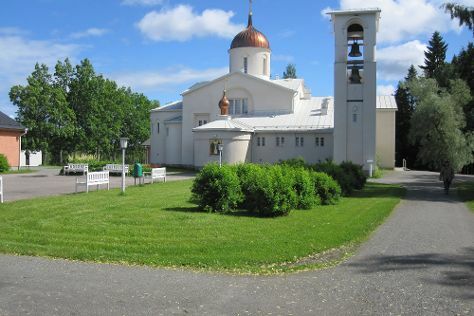 Here are some ideas for day two: examine the collection at Kulttuurihistoriallinen Museo and then contemplate in the serene atmosphere at New Valamo Monastery. To see maps, where to stay, reviews, and tourist information, go to the Kuopio online holiday maker . Getting from Tampere to Kuopio by train takes about 3.5 hours. Other options: drive; or do a combination of train and flight. In June, daily temperatures in Kuopio can reach 20°C, while at night they dip to 11°C. Wrap up your sightseeing by early afternoon on the 27th (Thu) to allow enough time to travel back home.